Big Data and PMML, the Predictive Model Markup Language, are hot topics these days. But, when combined with in-database scoring, they take a new and powerful meaning. It is then no wonder that Zementis is thrilled to announce its partnership with Teradata, a global leader in data warehousing and analytics. 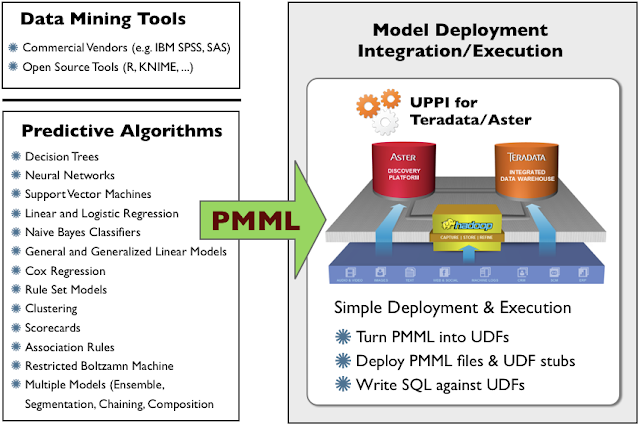 Zementis is pleased to announce that its Universal PMML Scoring Engine (UPPI) will soon be available on the Teradata and Aster databases. Zementis offers a range of products that make possible the deployment of predictive solutions and data mining models built in all the top commercial and open-source data mining vendors. Our products include the ADAPA Decisioning Engine for real-time scoring and UPPI, which is currently available for a host of database platforms as well as Hadoop/Datameer. With UPPI for Teradata and UPPI for Aster, Zementis is expanding considerably the number of advanced platforms able to combine in-database scoring and data warehousing for rapid, on-the-fly predictive analytics on large volumes of data. UPPI for Teradata and UPPI for Aster enable analytic enterprises to realize significant business value from new business models and help companies drive both top-line revenue growth and bottom-line cost savings. Check out the Zementis website for webinars, presentations and product data sheets and to learn more about in-database scoring with UPPI.